People with fibromyalgia syndrome show symptoms of bone and muscle pain tenderness and fatigue. Exercise can help adults and children with fibromyalgia syndrome in a number of ways. Exercise can stop loss of function in fibromyalgia, and even begin to restore lost function in some people. Exercise can help improve sleep (avoiding alcohol and caffeine before bed can also support this). Exercise releases natural substances called endorphins, and these are natural painkillers as well as lifting mood, so may also relieve some of the depression associated with fibromyalgia syndrome. Joining a gym doesn’t have to involve high-impact exercise, and includes the opportunity to make new friends too. Some people suggest that exercise may also raise the pain threshold, helping people better tolerate the pain of fibromyalgia syndrome. If overweight, losing weight will help all disorders that involve muscle or joint pain, and exercise will help this process. It’s important for everyone to keep a doctor informed about any new exercise programme, but especially for people with a chronic disease such as fibromyalgia syndrome. There is good scientific evidence that aerobic exercise helps fibromyalgia syndrome. Low impact aerobic exercise includes swimming, cycling and walking, and using exercise bikes and cross-trainers. With all the exercises, start slowly and gently increase the length of time or the intensity of the exercise. Swimming and other water-based exercises such as aqua-aerobics can help by providing cardiovascular exercise but also supporting muscles and joints. Some people may find that the water needs to be fairly warm to avoid muscle pain. Some water classes are suitable for non-swimmers. 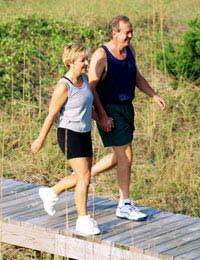 Walking is a gentle weight-bearing exercise, but walking on hard surfaces can cause or exacerbate joint pain. If this happens, try walking on grass in the park or garden instead. Strength training exercises can help people with fibromyalgia syndrome. Programmes include exercises using elastic strips and bands, colour-coded for intensity, as well as weight training (fixed or free weights). Exercise might make people with fibromyalgia syndrome worse in the short term, but should help overall in the long term. Begin slowly and increase intensity slowly – some people with fibromyalgia syndrome may find they get setbacks after exercising, especially if they try to do too much exercise. If this happens, take some rest, don’t despair, and try again – there may not be improvements every day, but keeping an exercise diary will show the improvements over a longer period. Different people’s bodies will react in different ways, so don’t try to keep up with the rest of the class, or push too hard, and just look for the little (or perhaps even big) improvements over time. If one type of exercise doesn’t suit, another type may either be more appropriate. Some people with fibromyalgia syndrome find they get exercise-induced pain between one and three days after exercising – because of this, leave about a week between each change or increase in intensity in the exercise programme. Be aware of changes in pain – a bit of discomfort shows a good workout, but too much pain might indicate too strenuous a programme. As with all exercise regimes, it’s important to pick something that’s easy to get to and fun to do, set up a routine and don’t set unrealistic goals – that way it will be much easier to keep going long-term. There is no scientific evidence that exercises to improve flexibility help fibromyalgia syndrome.